Third shop in about as many years- I think I'm getting a hang for this moving thing. On the upside I have been developing better work flow and reducing my clutter each time. By the low interior window I have tube and parts storage, my "office" and a desk that is on it's way to becoming a dedicated assembly and packing station. Out of frame I also have a shelving unit and storage for build kits. Along the windows are the tacking fixture and the heart of the establishment, my vise and pedestal. If I had to chuck it all and go back to square one I'd sneak this with me. Opposite the storage wall is my lathe- big enough to pretty well take up the whole side save my mitering center. The alignment table rounds out the set up. The ceilings are about 20' with the cross beams at about 12'. 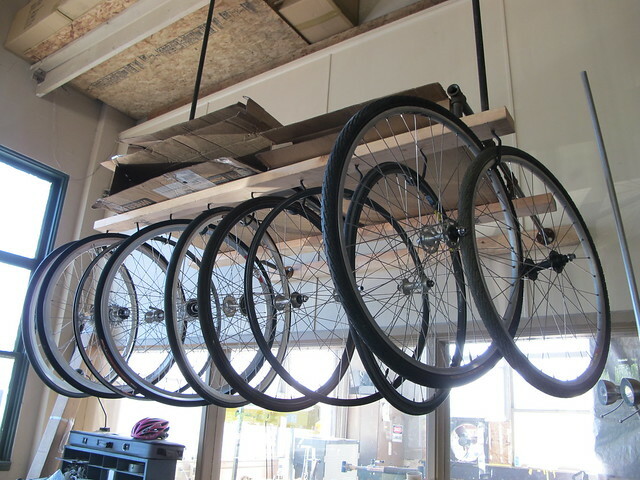 This dropped rack allows me to hang two rows of wheels with some overhead for boxed rims and fenders without having to go "all the way" or use a hook. And my current new toy- the rolling work station! I hate horizontal work space, or at least my inate ability to make any flat surface a catch all. 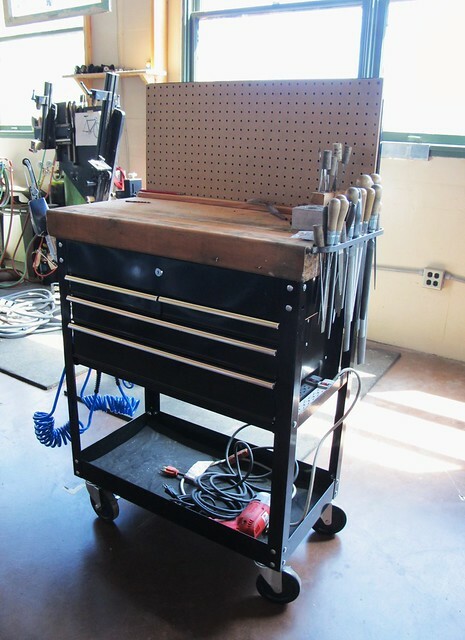 This tool cart has a small butcher block top , a peg board, and drawers for all of my most reached for tools. Facing the camera is the file rack, and oposite is an air manifold. 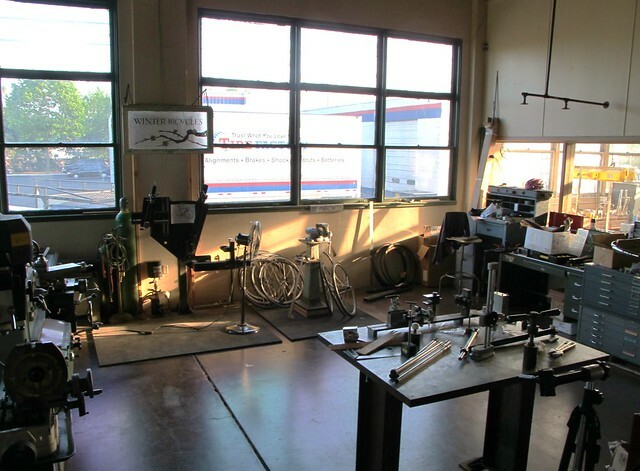 I'll be able to have easy access to hand, air and power tools anywhere in the shop and will only have to worry about a single air hose and electrical cord on the floor. 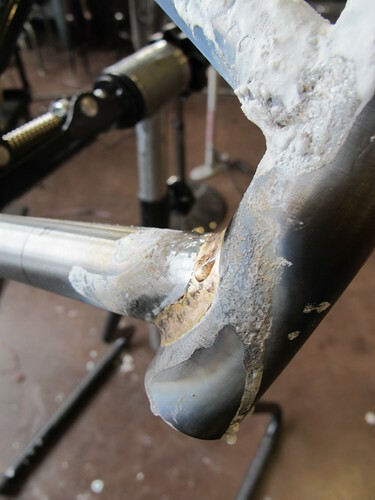 I met with my first client in the new shop today, and wrapped up Mark's fork as the first project. I still need to run power to the lathe and add a few interior walls, but I'm up and running again, and that feels great. Last edited by Eric Estlund; 08-05-2011 at 12:30 AM. That is a very nice looking shop. The windows are great and hopefully are sealed up well so you can get some warmth from the sunlight in the winter. If they leak that will be a heck of a heating bill! The floors look nice and smooth without cracks. That must be a true joy. I could not agree more on work benches. All they do is add to my clutter. Enjoy and congrats. A side benefit to not having much bench space is getting to use that nice floor as a fun photo back drop. 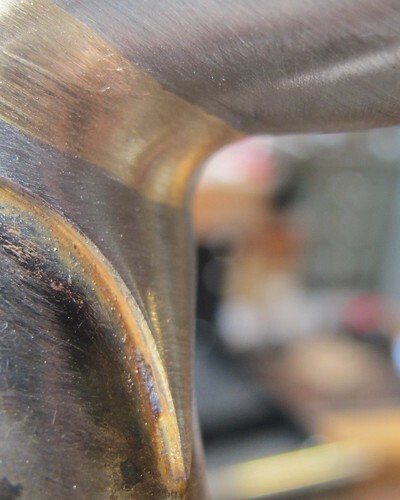 I've been shotting the construction of Mark's bike and thought I would cross post some of the construction shots from my blog. 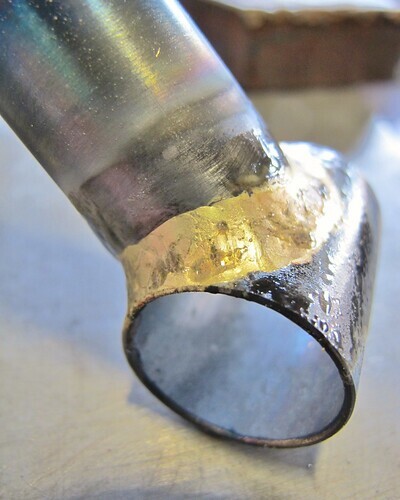 I tack the tubes to hold the basic shape. Note the tight miters- close coping allows for a precise fit up, and tacking the frame "locks" these positions. From the jig the front end goes to the alignment table to check the position. 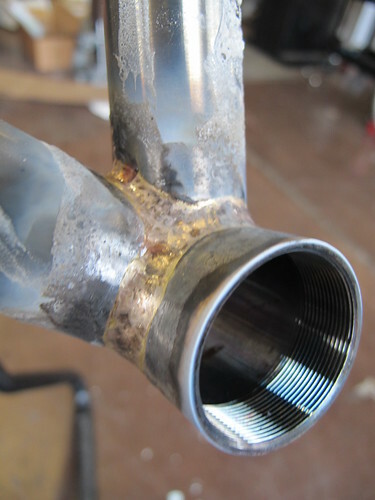 I use the info I find here to plan the brazing sequence and use the heat and brass to straighten the frame. 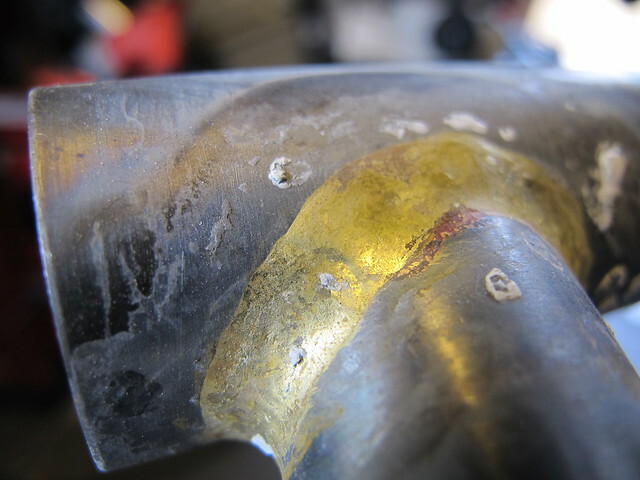 Here is that same joint with a layer of brass stitching the tubes together. 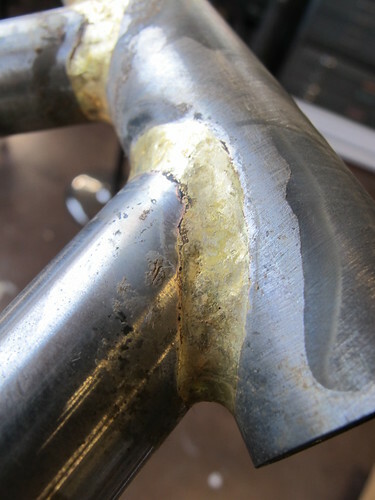 The even fillet width and shape with the smooth feathered edges will make for relatively little post brazing "clean up". 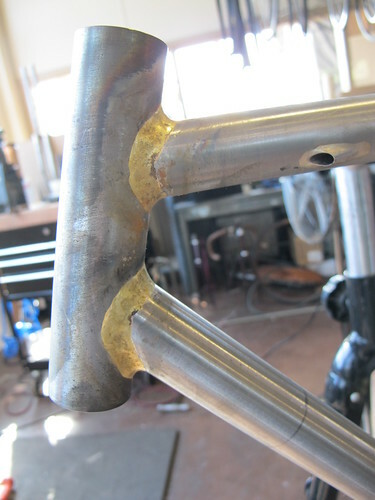 Here is a shot of the same joint coming around the bottom of the down tube- you can see how smooth the edges of the brass are where they flow onto the down tube and BB shell. 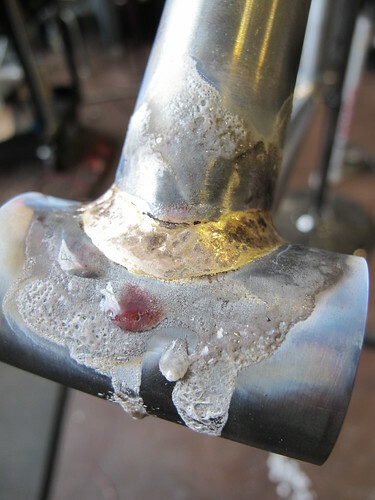 Once the full front end was brazed I soaked it in a heated and agitated water bath to remove the brazing flux- this is that down tube joint bare from the torch. 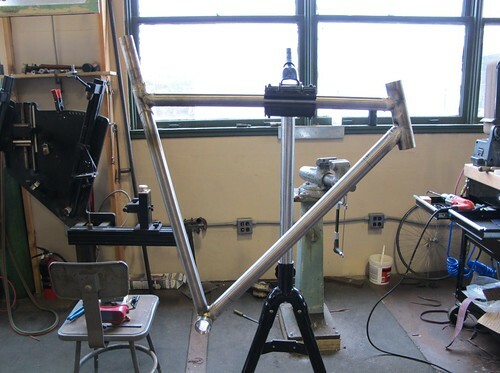 I've started in on the rough finish work- I like to get these fairly well finished as a sub assembly- it's easier to manipulate the front end on it's own, and it allows better access to the seat/ top tube joint before seat stays are added. I'll post pictures from that process soon. Last edited by Eric Estlund; 09-05-2011 at 02:56 PM. Beautiful work Eric. 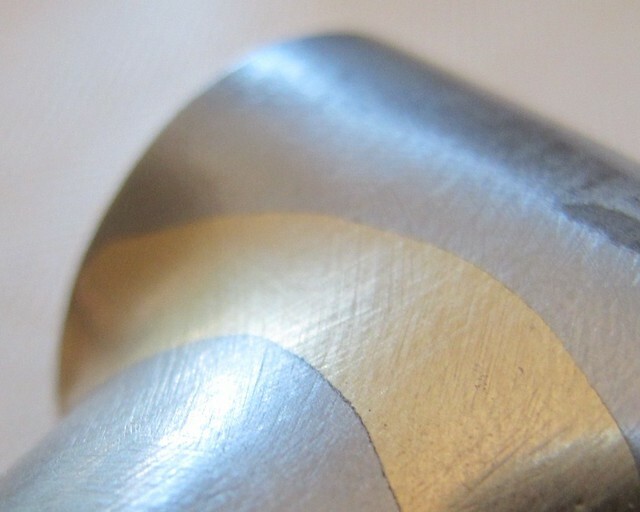 Can you give us an insight into filler and flux used? How many tacks and where? 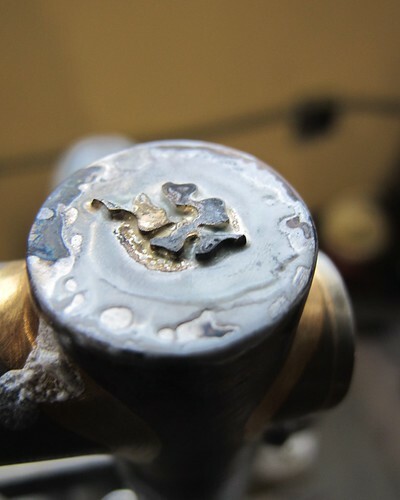 I generally use CO4 (Gasflux's 680 low fuming nickle bronze). Some time ago I called up GF at midnight (that's 3am in OH) expecting to leave a message. 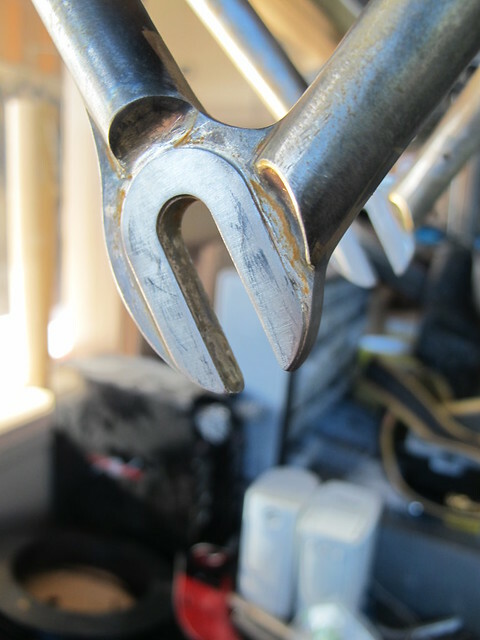 I was calling to schedule a rebuild on the old Mtn Goat gasfluxer I picked up from Paul Sadoff (he'd been using it as a door stop since buying a TIG machine 20 years ago). To my surprise a flux engineer picked up and we had a really great chat for about a half hour or so regarding fillers, fluxes, different combos, etc. He had nothing but glowing things to say about bike builders- I guess what we do is a skill set fairly well lost from industry (or now the purview of robots). He helped me order a box of bronze and a bunch of type U and B fluxes, as well as some H for stainless. I also ordered a refill on liquid flux. 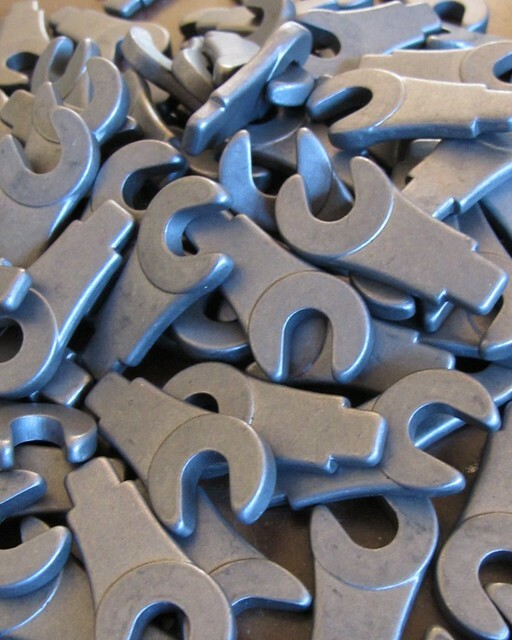 That was sort of long winded- I also use P&I, Harris and Cycle Design silvers, and have used their LFB for some samples in the past, and may be ordering more when I work through this GF product. LFB is more then strong enough, but I like the extra strength of nickle based fillers (including nickle silver)- even if it is mostly academic. 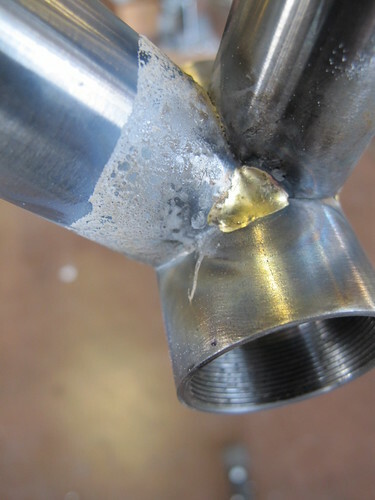 Those sample joints linked above where on three bikes in a small production run- same tubes, same miters, etc. Every combo worked just fine, and if you asked me which was which from the photos alone I'd be hard pressed to answer now that it is out of direct memory. I think most of it boils down to batch consistency and the operator. If the flux is good and rod after rod is of good quality and the same flow properties I think good brazers could adapt pretty quickly. The tacks are somewhat based on positioning/ joint access. 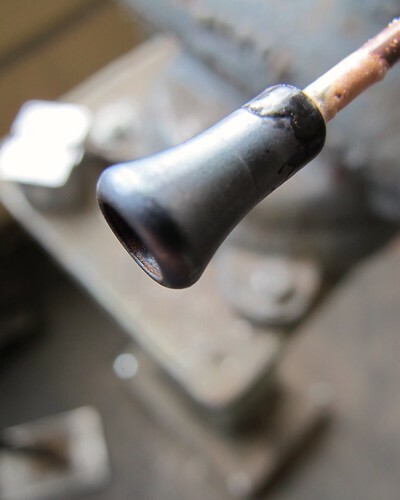 I have taken to doing more wideish tinning tacks at the tops and bottoms of tube miters- so that there is a slight wrap around the tube of maybe a centimeter rather then just a spot tack. Last edited by Eric Estlund; 09-08-2011 at 01:37 PM. My interview with Diane aired last night- here is a link if you would like to hear it. 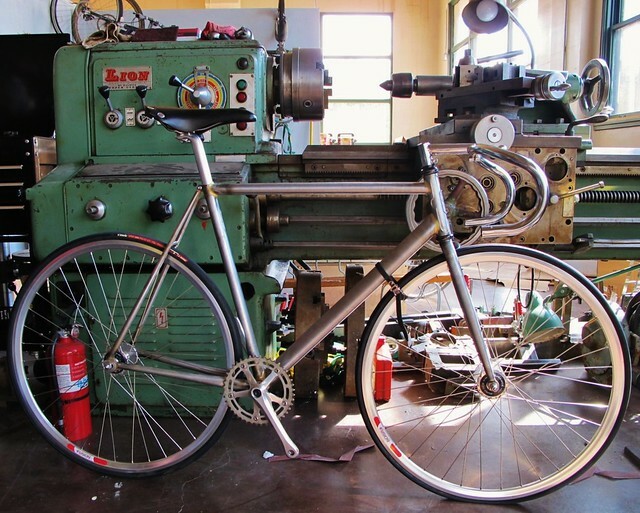 We discussed my involvement with the Oregon Bicycle Constructors Association, the Oregon Handmade Bicycle Show, the state f building in Oregon and some of what's happening here at Winter Bicycles. My interview with Diane aired last night- here is a link if you would like to hear it (I'm the last guest). i finally got to listen to this download atmo. mad props, eric - that was a cool, smooth, and informative interview. Thanks, Richard- it was fun to talk about both Winter and the OBCA in the same sitting. Some days you light yourself on fire. 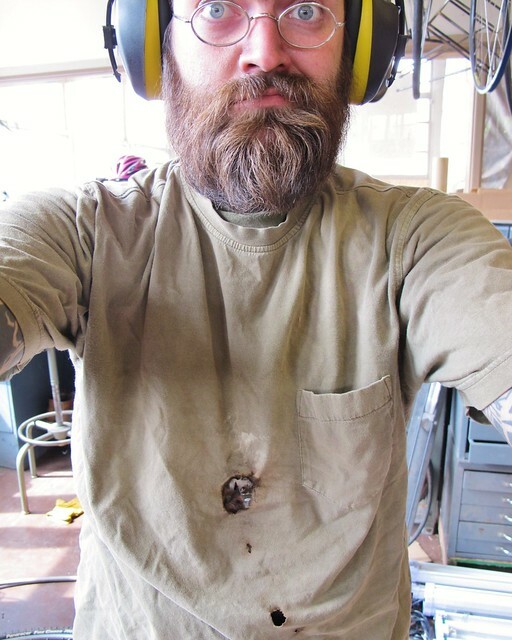 While cutting the laminate I looked down and noticed 5" flames coming off the burning hole in my chest. Oops. Last edited by Eric Estlund; 09-16-2011 at 08:44 PM. Spamjoshua asked about the project track bike over in the FNL comments, so I thought I'd post here with a better description. Every now and again I get an itch to build a certain bike. In some cases it's to work out some ideas, some times to try out a new material or process, or, like in this case, just because I think the bike should be out there in the world. In this case I've been working on a bike I've been calling the Navaja- a mean little track rig. In my head it's a scrappy street fighter type of bike. Short and stiff rear end, aggressive geo and drop and some details I wanted to tie together. These "after hours specials" sometimes turn into demo's or show bikes before finding good homes- I have some paint ideas I'd like to incorporate and show this one. 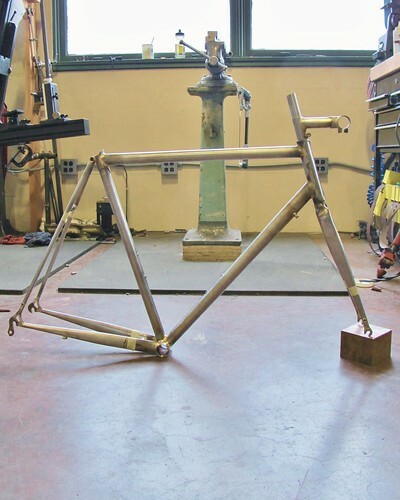 We'll see if that happens- project bike paint is a pretty low priority. In any event, I think it will be a hot race bike. If anyone needs a new bike with a 55cm top tube, give me a shout. Last edited by Eric Estlund; 09-17-2011 at 07:22 PM. Extremely hot Eric, can't wait to see it finished! I think you posted the stem on facebook? Very cool as well. Yeah, that's the one! Beautiful! It is beautiful. Really great lines on that whole bike. I didn't want to derail this thread, so I thought I'd post over here. I mentioned him in my original post, but I wanted to give Eric @ Winter and extra mention. 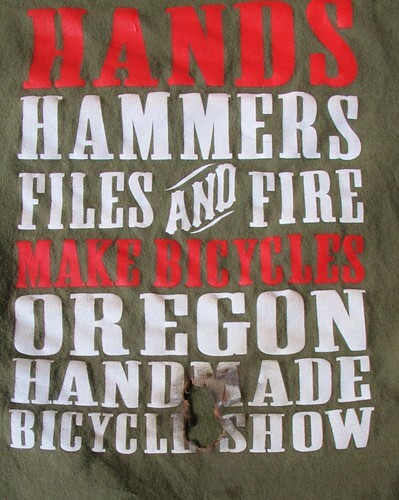 I'd chatted with him at some of the Oregon bike shows in the past, and of course admired his work on FNL and Flickr. 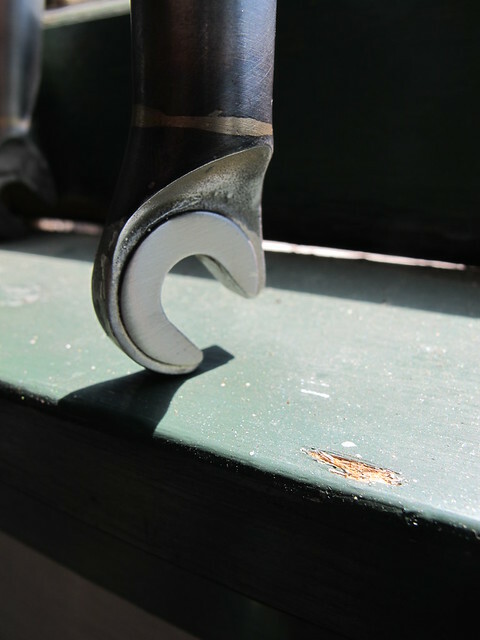 It wasn't until I was shopping around for a custom stem for a really nice, new-to-me frame that I gained an appreciation for working with Eric. Steve Hampsten (truly a man without peer) recommended him. Eric is extraordinarily efficient (or at least gives that impression), a fine craftsman, knows his stuff and has an eye for detail - and a talent for verbalizing it. The product rocks, turnaround was fast, and I can't wait to work with him again. Hard to beat. To that all I can say is wow, and thank you. First off, hug thanks to Steve for the recommendation and BS for being a very easy client to work with. Customer service is a huge part of what I try to provide my clients, but it's the hardest part to show (I can't take a photo of it, and it's usually not appropriate to post emails, etc). 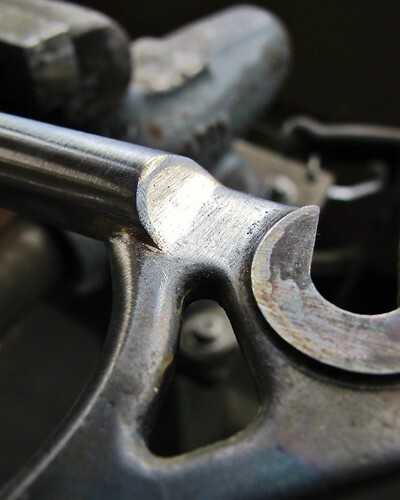 I don't get it right every time, but I strive daily to make sure the people I work with and for know were they sit in time/ design/ fabrication/ finishing, etc. and know their work is a priority. I'm always thankful when someone is pleased enough with the process to talk about it unsolicited in a public forum- thanks. For a regular overload check out the flickr feed. I've fallen a bit behind in the blog- but I'm working on catching up some updates for the several projects that have come through in the last few weeks. That stem is gorgeous Eric ! 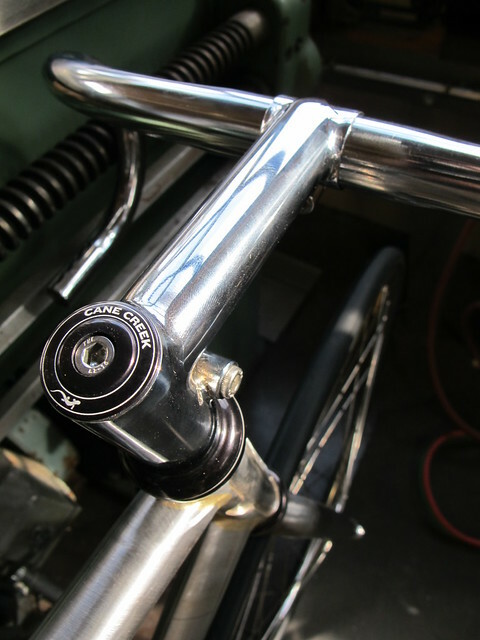 Here is a photo and detail heavy recap on Joe's new frame. I can't wait to get this one built up!